Player and composer Jacob Wick is making his presence known in the international jazz and creative music scene. He has been playing and studying jazz and improvised music since he was 10 and has performed in numerous venues, including a 3-week tour of europe in 1999; the Aberdeen (Scotland) International Youth Festival in 2001,; and the Banff (Canada) International Workshop in jazz and creative music in 2004 and 2005, to which he was personally invited by Dave Douglas. He has studied with Jon Faddis, Dave Douglas, Rudresh Mahanthappa, Vijay Iyer, and Misha Mengelberg, and has performed with Han Bennink, Gerald Cleaver, members of the Count Basie Orchestra rhythm section, and Mark Turner, among others. 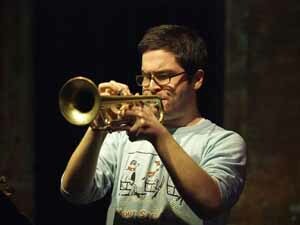 In 2005, his band THROE was invited to play at the FONT festival of new trumpet music, curated by Dave Douglas; and in 2006, a project he is part of with two irish musicians called White Rocket toured Ireland to rave review. More recently, a sound installation which Jacob designed and built, called "Mistletoe," went on display at the rough:space gallery of the DANK museum (Chicago, IL). Jacob is currently on the staff of the dance conservatory at Purchase College, SUNY, where he accompanies Neil Greenberg's advanced improvisation class. He currently resides in Astoria, New York.